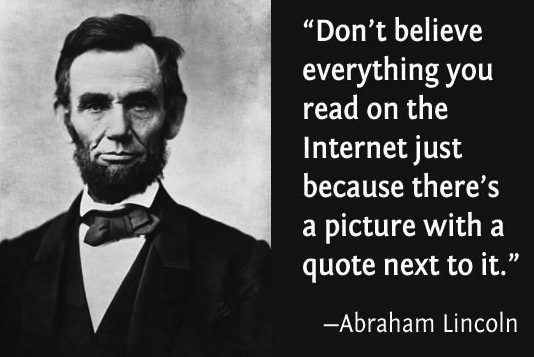 Well, if you believe the quote above is really by Lincoln, then there is something wrong and you belong to that growing demographic of those who do not question anything they read on the Net because you know, if it’s on the Internet, then it must be true. A few days ago, a fan posted something about two female celebrities being friends. It was the first time I came across it and my friends who I asked did not know about it. Today, I had a eureka moment when I was scrolling through Twitter and saw something. I realized that the post was based on another tweet, though tongue-in-cheek, that Celebrity A must have been hanging out with Celebrity B because they were wearing the same clothes (if this were a male and female, then they wouldn’t just have been friends, they would have been real). The fan obviously took that tweet as “truth” and re-posted it. She read it somewhere, she said, without quoting the source. Some picked it up and passed it on (including myself, though with skepticism and with the agenda to verify it). That, in a nutshell, is how lies are spread on the Internet. We have been spoiled by technology that doing “research” and “background check” is no longer an option. Which is ironic because technology has also made it easier for us to counter-check “information” we see online and verify whether they are the truth or a lie. Of course, you have to be mindful that the resource you go to for verification is not the Baidu rumor mills or Wikipedia. Ideally, you should go to the direct source and not to a friend of a cousin of a co-worker of a distant relative. But of course that is impossible when it comes to celebrities, and no, delusions that you are “connected” to them do not count, so one just has to take with a grain of salt things that one reads online. Unless you are a DNA-verified family member, a biometrics-authenticated manager/assistant or a publicly acknowledged friend, or your claims backed by facts, actual events and direct quotes, everything is still subject to verification. Technology has made it easier to spread information and there are all kinds from truths to half-truths to rumors to propaganda to delusions to lies. Thing is, we have stopped questioning things. Critical thinking is gone with the wind because sometimes it’s easier to believe in what makes us happy or what is convenient for us. That’s fine, as long as one does not spread it as gospel truth and insists that everyone believes it. Also, when you put out your delusions theories propaganda thoughts out there, specifically on SNS, don’t expect everyone to agree with you, take it hook, line and sinker, and not be criticized. Because alas, and thankfully, there are people who still think. *This post was inspired by a conversation I had with a friend today.